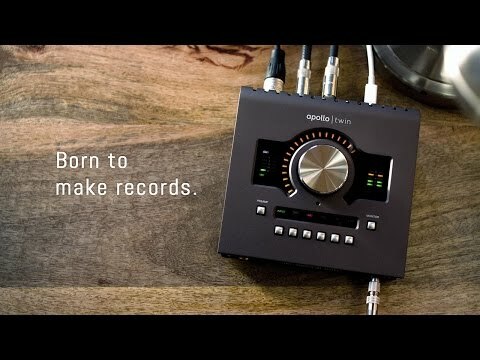 The Universal Audio Apollo Twin Duo MKII Thunderbolt Desktop Interface has been redesigned from the ground up to further empower this professional desktop recording interface. Complete with enhanced audio with the tone, feel, and flow of analog recording conversion, the Audio Apollo Twin Duo MKII will give you the ability to record with next-generation quality. The Apollo Twin MKII builds upon the original Apollo Twin’s gold-standard audio quality with a completely redesigned A/D and D/A conversion method that delivers an increased dynamic range and ultra-low total harmonic distortion. The resulting clarity of this next-generation conversion is nothing short of breathtaking as you will have heard on heard on hit records by Kendrick Lamar, Coldplay, Brad Paisley, and many more. A Universal Audio breakthrough, Apollo Twin Duo MKII's Unison technology gives you the tone of the world's most sought-after mic preamps — including their impedance, gain stage “sweet spots,” and component-level circuit behaviours. Based on unprecedented hardware-software integration between Apollo’s mic preamps and its on-board UAD plug-in processing, Unison lets you record through stunning emulations like the bundled UA 610-B Tube Preamp and EQ plug-in, with more emulations available at the UA Online Store. The Apollo has some of the better preamps I've ever heard - lots of headroom, quiet at high-gains, and the converters are really sweet sounding. The Apollo Twin MKII offers a greatly improved monitor function in comparison to the original Apollo Twin including mute, DIM, mono, and ALT speaker switching. It also includes monitor remote controls and a very useful built-in talkback mic for easy communication with the studio talent and/or recording slate cues. These features, combined with Apollo Twin MKII’s powerful scaleability, give it the gold standard for professional desktop recording. With the Apollo Twin MKII you can combine up to four Apollos and six total UAD-2 devices (SOLO, DUO or QUAD) adding I/O and DSP power as your studio grows. The rugged yet stylish build of the Apollo Twin MKII also ensures that it will be performing at its best with you for a lifetime. With the Apollo Twin MKII Desktop Interface you'll also receive the Real-time Analog Classics plug-in bundle containing some legendary compressors, stunning guitar and bass amp emulation as well as pre-amps and EQ's.